One of the best parts of being vegan is experiencing so many more tastes, colors, and textures. As a die hard foodie, an exceptional dish, in my opinion, needs to be both flavorful and also display a range of contrasting textures and colors. That’s why I created this slaw. My weeknight go-to dinner usually includes me filling a large ramen bowl with brown rice or quinoa and topping it with rows of complimenting macronutrients in veggie form like avocado, roasted root veggies, beans, and of course my favorite, superfood slaw! It adds that bright, fresh crunch that all the other softer foods that need to be balanced out. 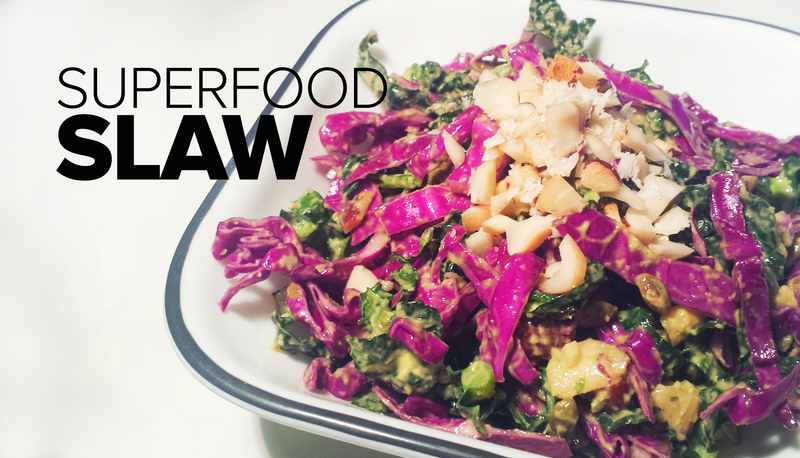 In addition to enhancing any meals visual aesthetic, this slaw merits its name due to the addition of black kale, purple cabbage, raw ginger, and raw garlic (watch out, pungent flavor not for the faint of heart). As a runner I look to get as many anti-inflammatory immune boosting foods in my system as possible and this slaw fits that bill. Black or Tuscan kale and red cabbage have some of the highest levels of antioxidants of any vegetable due to their characteristic deep purple and green hues. Ginger in raw form has a pleasant spicy heat and is packed with a strong anti-inflammatory compound called gingerol. Studies have shown that regular consumption of gingerol leads to a decrease in muscle and joint soreness and promotes a non toxic environment for your body to heal and restore itself. With the hefty dose of raw garlic included in this recipe I’d consider eating it at the end of the day and not before social gatherings. You’ve been warned. Garlic has so many health benefits I could write whole blog post on it alone. It is super important for me as a female vegan distance runner because it can help with the absorption of non-heme iron. There is a misconception that vegans have a hard time getting enough iron but in reality the problem is with absorption. Garlic contains diallyl sulfides that increase production of ferroportin and aides your body in effectively absorbing plant based iron. (Ferroportin is a protein that runs across the cell membrane, and it forms a passageway that allows stored iron to leave the cells and become available where it is needed.) I’ve experienced sever anemia at various times throughout my running career so I make sure to get a lot of garlic in my diet. Every little bit can help. 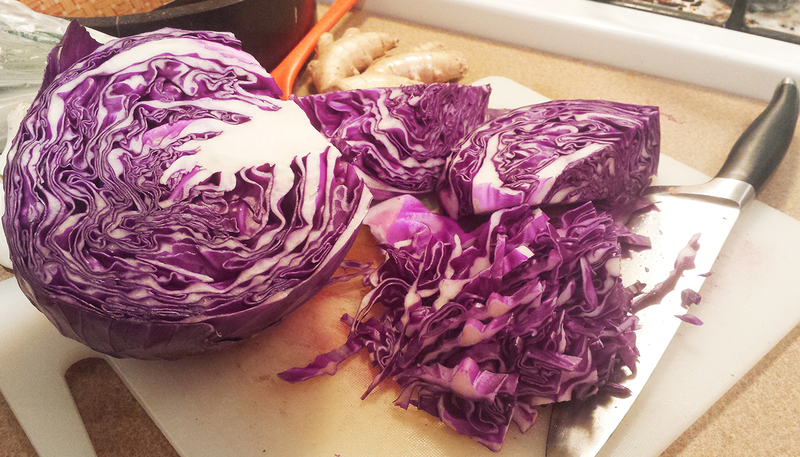 Wash and shred or finely chop cabbage and place in a large bowl. Wash the kale, remove stalks and finally chop the whole bunch. Add to your bowl. 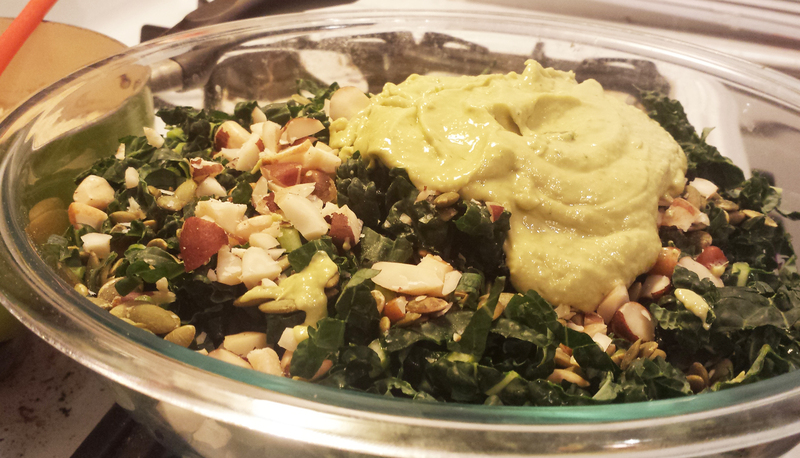 Chop the brazil nuts finely and stir into the kale and cabbage. 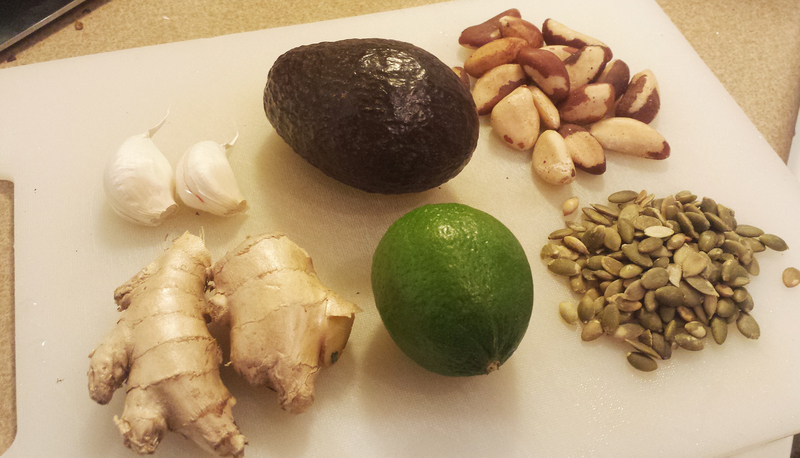 You can substitute cashew or macadamia nuts. Put all remaining ingredients into a food processor or blender and pulse off and on for 2 mins until creamy and smooth. Taste and adjust salt to your preferences. Pour dressing into the bowl and toss thoroughly.